Use Xapian::RangeProcessor instead (added in 1.3.6). str_ A string to look for to recognise values as belonging to this range. prefix_ Flag specifying whether to check for str_ as a prefix or a suffix. Check for a valid string range. A StringValueRangeProcessor always accepts a range it is offered, and returns the value of slot_ passed at construction time. It doesn't modify begin or end. 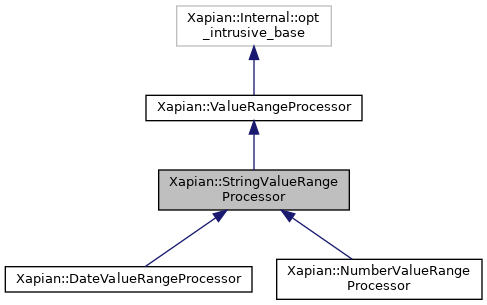 Reimplemented in Xapian::NumberValueRangeProcessor, and Xapian::DateValueRangeProcessor. Whether to look for str as a prefix or suffix. The prefix (or suffix if prefix==false) string to look for. The value slot to process.